Most warblers pass through our yards unnoticed during April and May, and again in August and September. Some stay to raise a family. As a group, they are the most colorful of the birds. They work in shrubs and trees feeding on insects. Insects are essential for them to increase weight rapidly to survive their long migration. 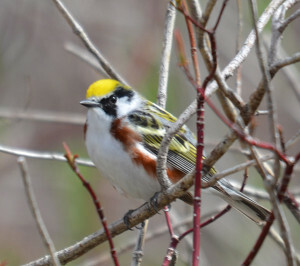 A Chestnut-sided Warbler is setting up summer residence in the yard among shrubs near the pond (Picture 1). It is one of the most colorful with a bright yellow cap and wonderful contrasting patterns of white and black throughout the body. Scattered yellow-green is present on the wings and rump. Varying amounts of rich chestnut orange-red patches line it sides. Adult males have extensive chestnut feathers on the sides and younger birds have shorter bands of color. When looking for warblers, most people locate them by listening for songs and search the branches for their small presence. The warbler described above is only 4 inches long and weighs less than one half ounce. To identify birds remember GISSS. First acquire a general impression (GI). Is it sparrow, robin, or crow size and does it stand tall and upright or more horizontal. Habitat will help with general impression. Expect some birds high in forest trees, others near the ground in shrubs, or some in wetlands. Most people know to think Great Blue Heron along stream or water, robins in lawns, and Red-winged Blackbirds in marshes. Each warbler has a preferred habitat. After acquiring a general impression, focus on size, color, and shape to help identify it. Behavior will help. 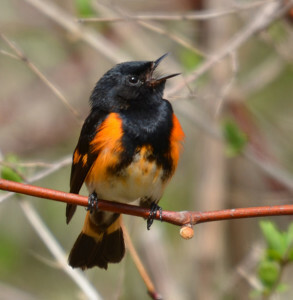 A Black-and-white Warbler will climb on tree trunks like a nuthatch; Chestnut-sided Warblers will be among the shrubbery as will American Redstart (Picture 2). Some warblers just pass through so expect them only in spring and fall. Others will stay for the summer. Very few stay during the winter but the Yellow-rumped Warbler is sometimes found in the cold months. The SSS in GISSS refers to the size, shape, and seasonality. Add another S if you use sound like many birders to identify a warbler. I am not good at separating species by sound. I consider myself at best 80 percent proficient so I do not document presence based on song. Pine Warblers are considered to have a stable population of 13,000,000. This sounds large but when compared to 200,000,000 European Starlings in the US it is not. Even starlings are not a numerous as humans in the US where we number about 350,000,000. Everyone’s yard can be critical habitat in a shrinking natural world. Encourage family and others to return portions of yards to native habitat to help warblers survive. Compare the difference between the two warblers pictured. The redstart has an all black head with white only on the belly and not mixed among the body feathers. There is bright orange on the sides instead of chestnut and it has orange in the wings and tail. Nature niches are more interesting when we get to know our wild neighbors. 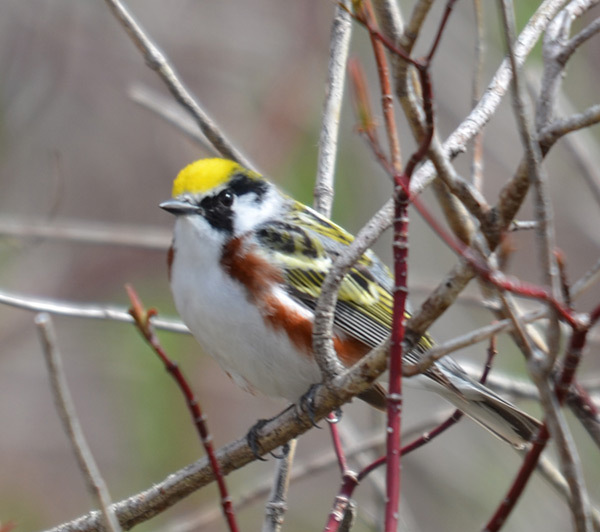 Warblers will come when yard habitats include native wild plants for insects and birds. Horticultural and non-native plants usually do not support insect populations needed by warblers. Natural history questions or topic suggestions can be directed to Ranger Steve (Mueller) at odybrook@chartermi.net Ody Brook, 13010 Northland Dr, Cedar Springs, MI 49319-8433. 616-696-1753.